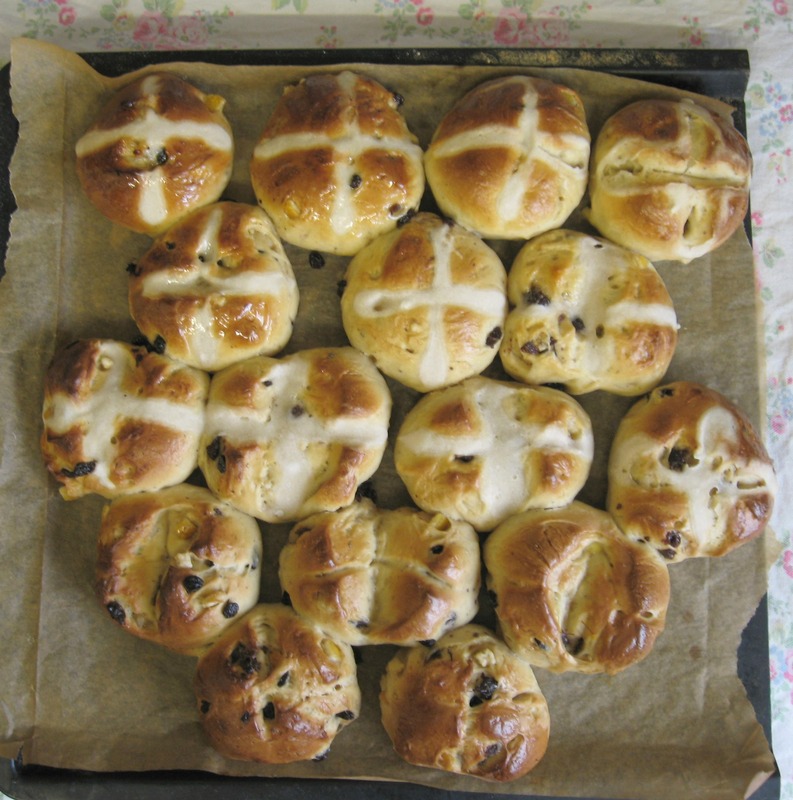 For the past umpteen years, around this time in the calender I’ve made spiced fruited buns….even though I can’t really tolerate wheat and grains anymore I felt it would be a bit mean to the boyfriend to not make them and to be honest, I wanted to make them for myself. Even though I’m not going to be eating them, the pleasure of making certain foods at particular points of the year is incredibly pleasurable. Even though I could make these any old time of the year, I never do…it’s the same with gingerbread cake and biscuits, once it’s January then I want citrusy smells in the kitchen rather than the spiced warm aroma of sticky gingerbread. (Unless it’s snowy then in that case a big tray of sticky ginger scented cake seems perfectly acceptable). I thought I’d experiment a bit this year, normally I use a recipe adapted from an Elizabeth David one, but thought to try and make some using our sourdough starter. As I’m really only making them for the beloved one, I’m just making a small amount but I’m sure you could easily tinker with this recipe to make a larger batch…….if reading through you think, what a complete and utter palaver and hoo-hah…..let me assure you that these really are very easy to make, mostly they are made up in stages, so you can potter about in the kitchen then leave the dough to do whatever then come back and potter a bit more…. Weigh out the sourdough starter, cover with a clean tea towel, set it to one side and allow it to come to room temperature. Using just a few strands of saffron, scatter them into some milk and gently warm it so that the saffron infuses the milk with both it’s colour and scent. Allow to stand for half an hour or so. In a large bowl, mix 100g of the bread flour with the starter. Warm the milk through a little, and then pour into the starter and flour mix. Sprinkle the dry yeast over the wet ingredients and then stir in the brown sugar. Cover and leave to one side for about an hour. Break and beat one egg, (save about a teaspoon or so of it and keep to one side for the egg wash) stir into the sponge, add the currents and fruit peel, melted butter, spice mix, salt and about 2/3rds of the remaining flour and then stir together before turning on to lightly floured work surface and kneed together, adding more flour as the dough requires it. Once the dough is ready, place it into a large bowl that has been lightly oiled and then cover with a clean tea towel. Allow to prove for at least 3 hours and then gently knock the risen dough back down. 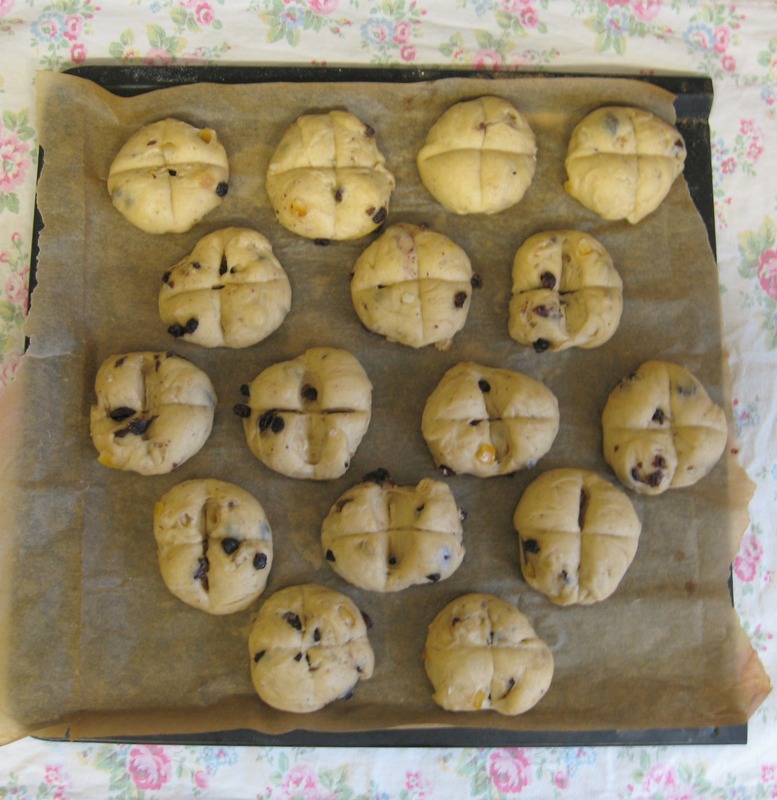 Roll out into small balls and place on a baking sheet that has been lined with baking parchment. 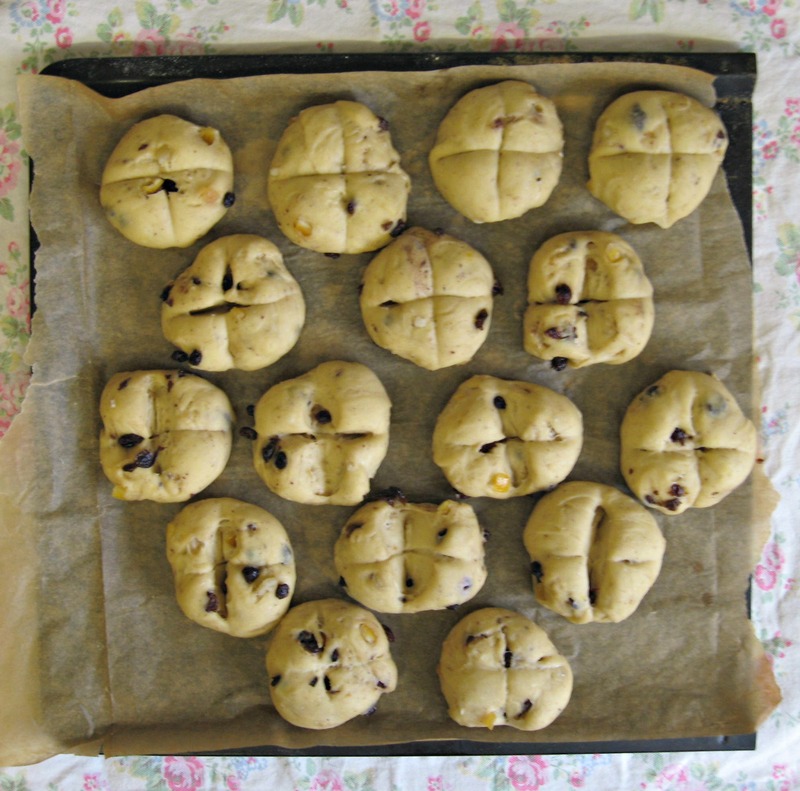 With the blunt edge of a plastic spatular, press across the centre of each ball of dough and then across ways, pressing down pretty firmly to make a “cross” pattern in the middle of the bun. (you might find the spatula sticks a bit, so dabbing it in flour every few buns helps to stop this)…At this point the buns are about the size of flattened walnuts and somewhat doll sized….don’t worry, just let them do their thing. Place in the fridge and leave overnight. First thing in the morning, remove buns out of the fridge. I know, they don’t look very impressive but they just need to wake up…. allow them to rise for about an hour and a half. After about an hour and ten minutes turn on your oven to around gas 6 and let it heat up for about 20 minutes or so. Beat the little bit of egg and a splash of milk to make the egg wash, coat the buns . Place the tray in the oven and bake for between 17 and 20 minutes. 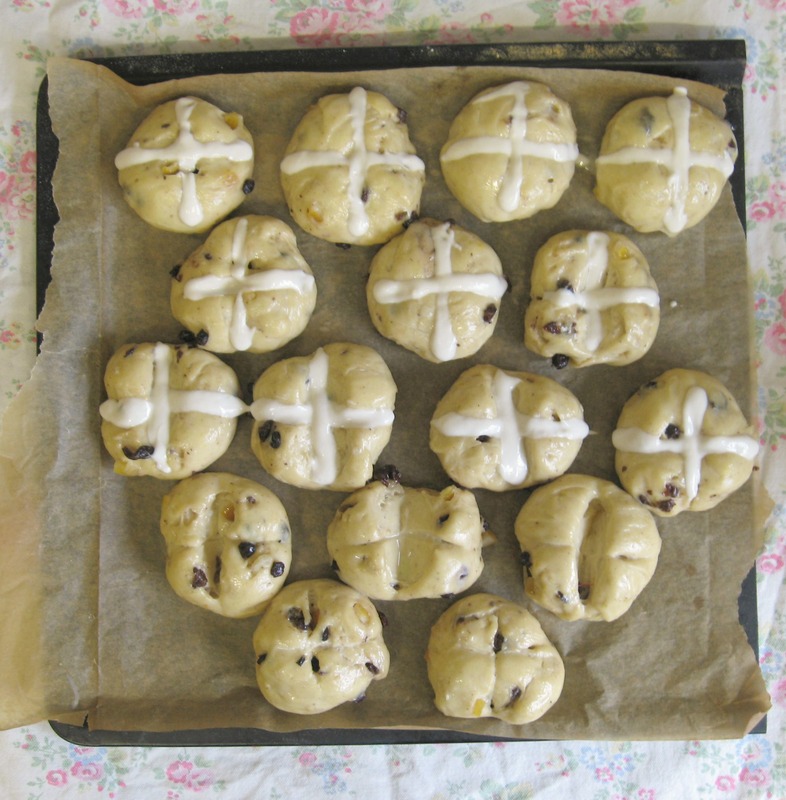 A few minutes before the buns are due to come out of the oven, mix the tablespoon of caster sugar with a little boiled water and stir well so that the sugar completely dissolves. As soon as the buns come out of the oven, cover them with the sugar glaze. Tear the buns open and spread with salty butter. We’ve just had these for breakfast, they smelt amazing when I took them out of the oven, and the boyfriend said they were so light and delicious that I had to taste a little bit of one for myself (a complete lack of self control found me then eating one all to myself so expect I’ll have an achy tummy later…but it was worth it.) They really are light, but not in that filled with airy insipidness that the supermarket ones seems to have. Not too sweet, just nice and spicy. This ended up making 16 small sized buns.